MERF 3.2 - Third generation of Mosfets. It has 10 functions. The newest is 3-rd burst firing mode. The system allows for lossless rate of fire adjustment and protects modern Li-Ion: LiPoly and LiFePO4 Batteries. It has active brake and protects your AEG by eliminating trigger burn-out. Smart Trigger allows for faster trigger response at the same rate of fire. Thanks two operating modes, system works with a standard and modified installation. No modification to your AEG is required. The circuit is compatible with most airsoft guns, including upgraded guns. It will operate with the strongest springs (including M170). Maximum battery voltage for PicoSSR, NanoAB and MERF 3.2 is 15V. How does the nano and pico deal with gun jams, if there a thermal cutoff? NanoAAB, NanoASR and MERF 3.2 are fully compatible with microswitches, as the digital Interface provides full compatibility with micro-switches. It is completely resistant to contact bounce. 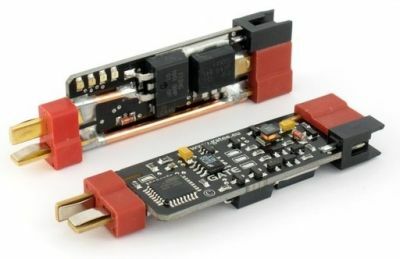 You gain a bigger ROF, faster trigger response and your MOSFET becomes less heated. Normally the mosfet is installed near the battery. So if the battery is placed in handguard, the mosfet should be placed there as well. We suggest to use mosfet with Active Brake, when aeg has blowback feature as it will work better. - Simple mode. No modification to your AEG is required. - Enhanced mode. Trigger connected to system.